Confused about the how people will access and monetize VR? You are not alone. 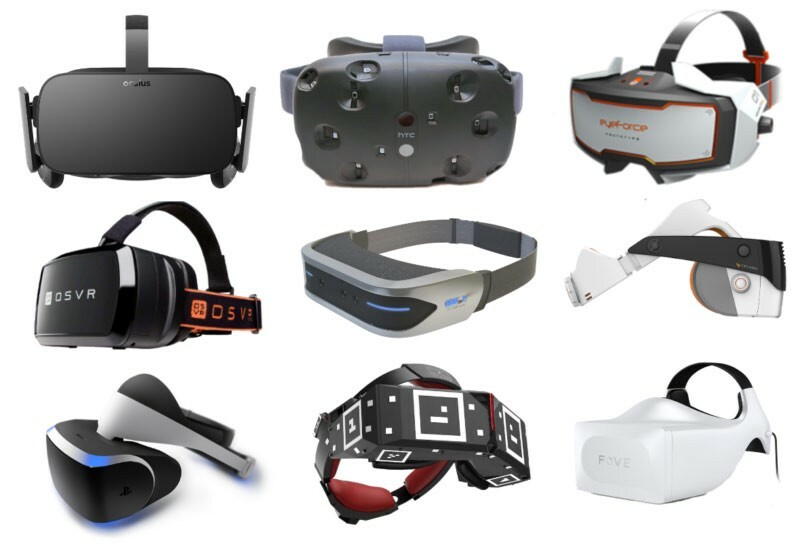 One of the first things about developing a strategy in VR is understanding the industry value chain — from the hardware, interfaces, platforms and software. This is a guide to help marketing professionals understand how people interact with VR, identify target audiences and develop an integrated digital and social media strategy. In the race for segment dominance, it’s still an open frontier. What physical object will your consumers use to access the content — headset, mobile phone, tablet? How will viewers consume their media? A technical interface is how people access content. What technical interface is your target audience using? Deciding the right interface may depend on the type of content you plan to deliver: gaming, interactive video, immersive video or social content. Different age groups and income brackets will use different headsets. Samsung (Gear) and Google (Daydream) have developed quality headsets to connect with their respective smartphones, delivering a broad array of content at accessible prices. Often sold as packages at mobile phone retailers the headsets are relatively inexpensive ($79.99–129.99), and enable online browsing inside the headset for content, including Google Chrome and Youtube360. Samsung delivers its apps, games and experiences via the Samsung VR app, or from SamsungVR.com. Both Samsung and Google Daydream have open architecture, meaning there is no captive content — users can view whatever they please once inside the web. So if users wish, they can access Facebook 360, Youtube 360, or surf the web inside the headset. Facebook has also entered the VR game by purchasing the Oculus Rift headset. The Oculus is compatible with Samsung (Android) phones. Facebook’s strategy is to increase volume of (paid) content on its online platform by delivering headsets into the hands of end users. Users access content by skimming through Facebook posts, or going to the Facebook Oculus Store on their mobile phone. Users can also access the store via the mounted headset. The range of available content on Facebook will likely be vast, even though it is presently in early stages one can easily imagine it dominating the space, possibly outstripping YouTube 360 since it already hosts both social and corporate pages. The HTC Vive which delivers room scale VR, is one of the most sophisticated VR interfaces in the market and the most expensive, retailing at about $799.00 on Amazon. It also delivers some of the highest-quality immersive gaming experiences. However, you need a powerful PC to run the content. 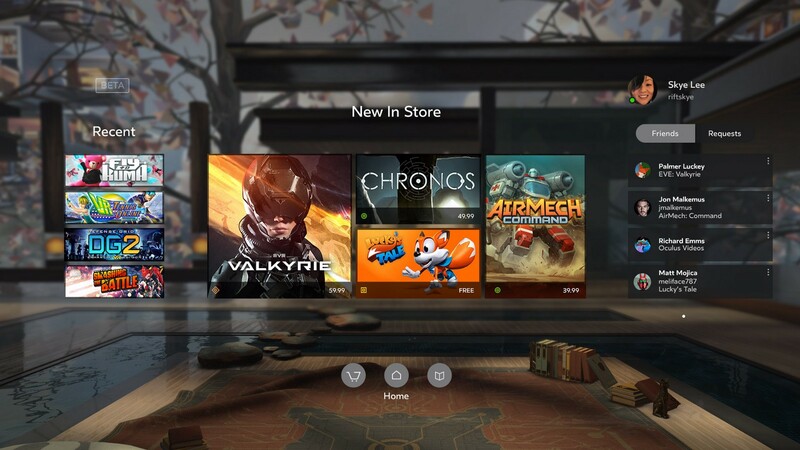 Despite the high-quality resolution, the Vive has limited non-gaming content, and has “closed-architecture” meaning it does not allow external content surfing — so users can only access captive video and gaming content on demand. While the high price point and average VR user (male age 30–39) makes this is a very attractive target market for potential advertisers for product placement or branded content, there is no guarantee your content will get on the platform. Despite the price and limited non-gaming content, a 2017 Sketchfab survey of 800,000 participants, showed the Vive headset was the clear preference (42%) amongst users of all headsets. Playstation has a VR bundle (PSVR), which costs significantly less ($399) than rivals Oculus and HTC Vive and, while lower in quality, it is really easy to set up. Plus, as the name suggests, there are lots of games available and it is popular among younger gaming enthusiasts. Acer (Microsoft) HP and Dell have also entered this bracket over the past year. Of course, the cheapest by far is the Google Cardboard — cardboard headsets are available on the internet for about $1.99. (They can be purchased in bulk for branding for even less). As the technology evolves and prices drop, the segmentation by technical interface may become sharper as clear market leaders emerge. But the technical interface is not nearly as important as the platforms the target audience will use to get their content. So now you know about the technical interface…where can people see the content? Platforms are the environments that host content…like Netflix, only for VR. So where do users go if they want to watch some VR or play games? And where could you place ads if you wanted to reach those users? Facebook aims for social users and aspires to create virtual “hangouts” like the iphone Hangouts — but In headsets, in virtual spaces, with avatars. And on Android. Facebook is investing heavily into VR for the purposes of carrying more branded content (which is effectively the current Facebook strategy except with VR instead of 2D video. And avatars.). We expect Facebook to remain a key marketing powerhouse for Gen X and Babyboomers, and with younger audiences when Hangouts goes live. As at this writing, Facebook has 70 Million 360 photos, 1M 360 Videos, and 580M views. That sounds like a lot of views yet with 2 billion total users, Facebook has an impressive potential upside for future growth in the segment. 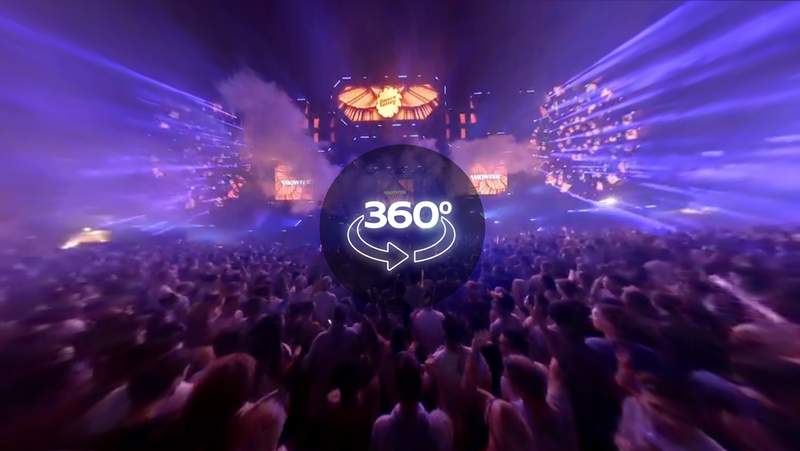 YouTube 360 is a rival for Facebook and has the advantage of already being a go-to choice for online video for viewers and advertisers. 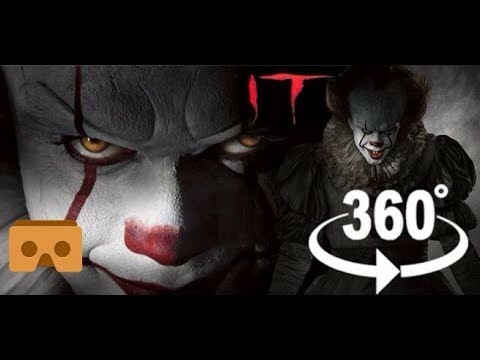 The recent Warner Brothers “It 360 Horror Experience” went straight to YouTube — much to the fans delight. Periscope allows its users to broadcast in 360 so viewers can experience the daily lives of people whom they follow and engage with the host. This is a highly social, interactive experience. Periscope users average in age 16–34, with a 41% of total users the 16–24 age bracket — and a high percentage (35%) of female viewership (see chart). This is a particularly strong opportunity for brands seeking to leverage existing brand influencers and to create native content targeted towards Gen Z and millenials. Vimeo hosts 360 video (VR) content, but they consider theirs a more curated experience than Facebook. Vimeo is for creators and artists and is not a distribution platform for the masses. Hence, this is a medium for more exclusive brands or brands that hope to raise their profile by affiliating themselves with niche content that is unique, cool or artistic — anything but mass. Another curated VR content provider is Littlstar. The Littlstar app is the only VR network available on Apple and Android TVs and hosts content from some of the biggest names in broadcasting and media, including NBC, A&E, National Geographic and Disney. It is also available on Playstation VR, Google Daydream, Oculus Rift, HTC Vive, and Gear VR headsets. True to its name, this “Littl” Star may well end up being the defacto source for quality VR cinematic, serial VR /television and indie content. Placing ads with a platform like Littlstar will be easy since they already have established viewer demographics hence, the metrics will be easier to project. Samsung, Discovery and major broadcasters are hosting 360 video and VR experiences on their own channels — effectively 3D magazines. There, the opportunity for branded content is obvious, but what is less obvious is the traction they have managed to gain in the scramble for viewership. Firms like Accedo TV are disrupting broadcasting and TV by developing a premium streaming channel optionsfor 360 immersive content. Finally, you can also host the content in your own app, which can be downloaded on the Google Play Store or ITunes. There are metrics for that — and heat maps, too. When it comes to VR content, we are in the very early stages of development. The platforms have been created but there is a dearth of available non-gaming content or support for emerging 360 film makers. What we are witnessing in VR can be likened to the first year of MTV. The interest is there, but few content creators know how to use the new medium well and advertisers don’t really understand how to use VR in integrated marketing campaigns — much less how to measure and monetize it. On the other hand, the good 360 video that is available gets a lot of attention! The main age demographic for VR is male, aged 25–39, with the highest usage rates aged 30–34 and second highest 35–39 (MetaFAQS). To measure the effectiveness of VR content, Facebook 360 and Athena’s Owl by Quantiphi have developed mind-blowing analytics (AI meta tags) to help identify your strongest characters and points of interest. The interest in different types of content is generational, and only some groups are willing to pay for the content. For example, simple games on the HTCvive can cost as much as $49.99 USD — which is quite expensive for one experience. 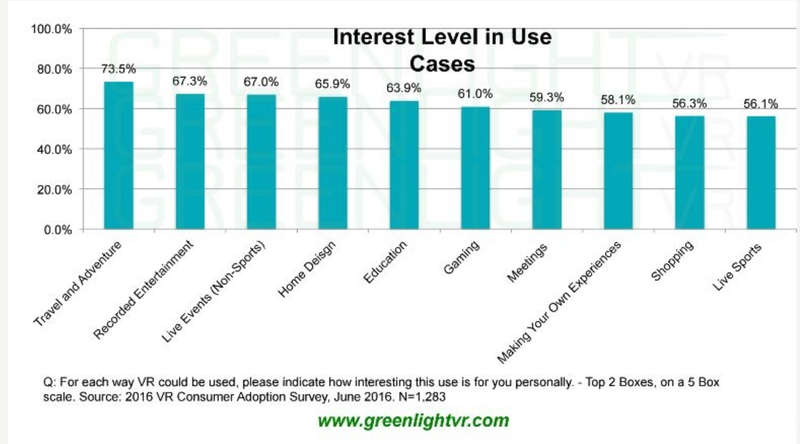 Yet, gaming remains the strongest category in VR. Adult entertainment will certainly have a paid audience, while travel content may not be able to command a premium. 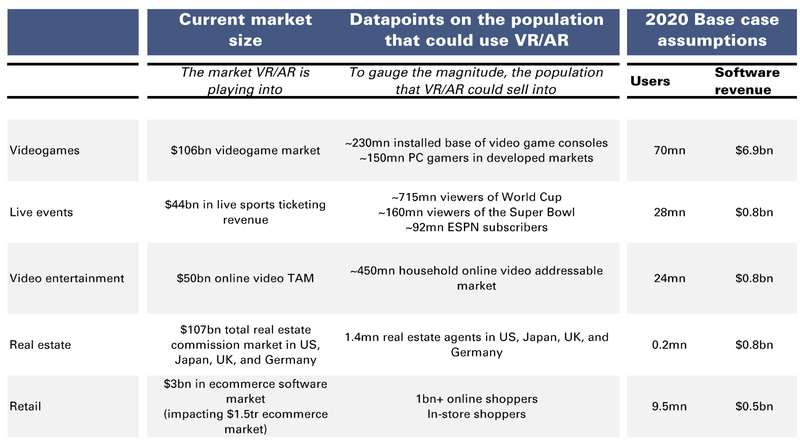 In its 2016 research report, Goldman Sachs estimated the largest markets for VR would be in Videogames (driving games rank highest), followed by Live Events (sports, concerts), Video entertainment (short movies, but serial television is under development), Real Estate (sales, hotel rentals) and Retail. However, a study conducted by Greenlight VR shows that Both Generation X and Baby Boomers ranked travel as the most preferred activity in VR. Generation Z as well as Millenials ranked gaming first, travel second. Travel and gaming are followed by movies, TV and live music events. As many as 70% of Gen X and Baby Boomers ranked travel first, but roughly half would be willing to pay for content. In targeting which type of content to use as a branded vehicle to reach a specific demographic, age will be an important variable to the strategy. For premium content, allowing users access to highly exclusive environments (going where they have never been before, or allowing on-stage or backstage views to expensive concerts or events) can deepen loyalty to your brand. Don’t Underestimate the Children’s Market! 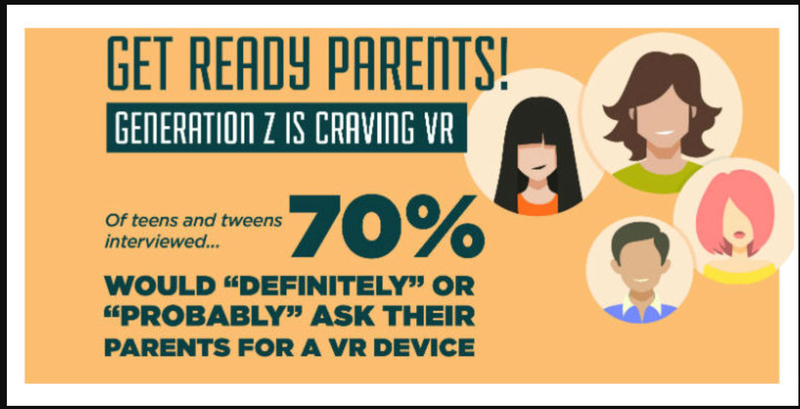 Generation Z (those currently aged 13–17 years old are particularly interestd in interactive entertainment, with 80% of them more likely to visit a store that offers it, and 80% saying the same about stores offering VR and AR technology, according to a recent report by Sonar. The segment for children’s entertainment and education will grow considerably as content from Sesame Street to education to user-generated content proliferates. Combining VR with AR games and merchandise will be a great way to get Gen Z’s attention and have a bigger impact. And now for the moment you’ve all been waiting for….! If your brand is sponsoring event, it makes a lot of sense to leverage that spend with VR and sharing the experience with as many people as possible. To do this, you would hire a production agency that can create an app and make it available, for example, on Google Playstore for sale. Alternatively, you might give it away to clients as a loyalty or bonus gift with a branded cardboard headset. Advertising may be done within a VR video — through product placement — or by creating branded content that is placed on a platform that reaches your target audience. Heat maps and metrics are available to provide you with the same analytics in VR as in traditional video. 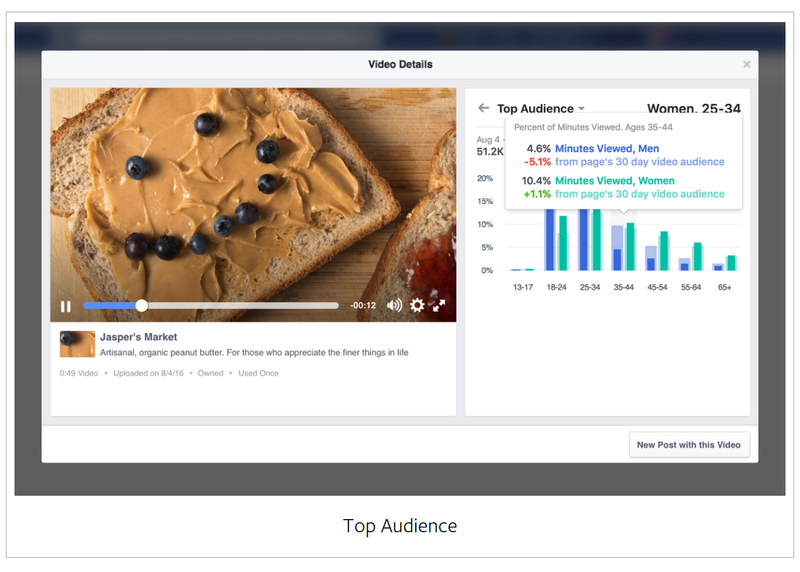 Facebook 360 has toolkits available to measure the effectiveness of 360 ads on its platform as it does for regular ads. The difference, according the representative, Joshua, at the IBC Facebook stand in Amsterdam, is that users interact and share VR video “eight times more” than regular video. Not a bad ROI. At Palpable Media, our bread and butter is advising brands how to use emerging technologies to create innovative marketing campaigns to establish deeper relationships with clients, and VR is central to that strategy. We ask clients to consider how to leverage VR beyond the video itself. Think about integrating VR across your digital and social media strategy. It will deliver ROI by generating more excitement for your brand or mission, and deepening the relationship with your core clients. 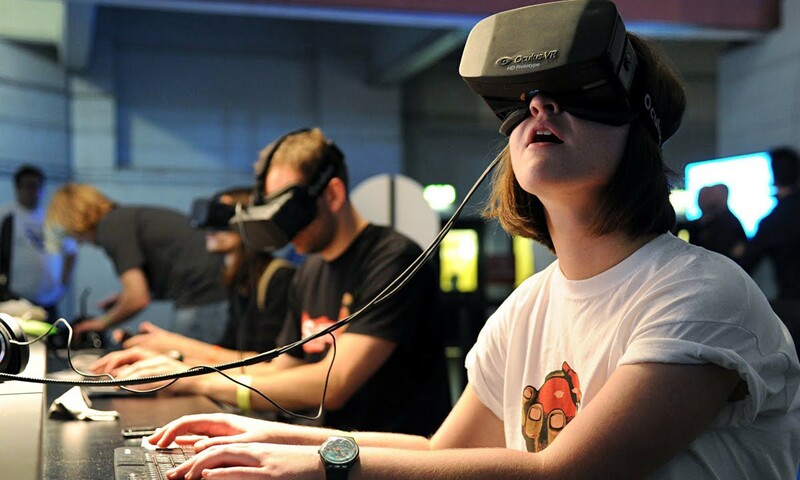 As every brand begins to develop a VR strategy, can you really afford not to? About the Author: Catherine D.Henry is CEO and Head of Partnerships at Palpable Media, an Emerging Tech Marketing Agency based in New York and London. She is passionate about new tech, art, and her new VR blog: stay tuned for more info!